Modula Vertical Lift Modules (VLM) are the highest quality storage and retrieval solutions, specifically created with space optimization and warehouse improvement in mind. 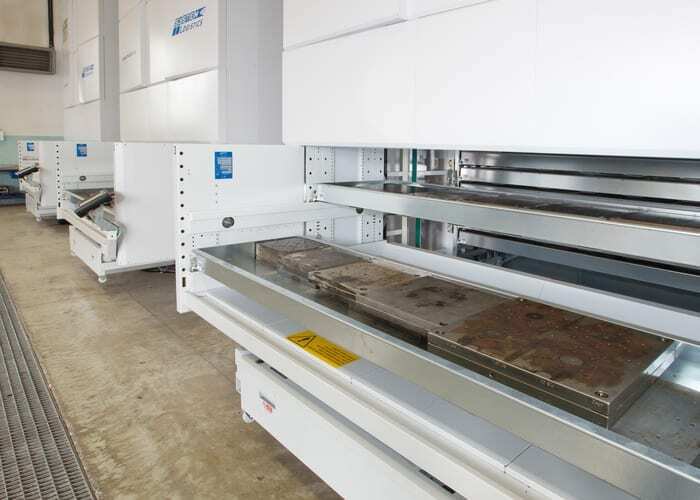 Partnered with Modula, we can free up to 90% of your available floor space, while also increasing picking accuracy, throughput, and security. Modula’s automated storage technology can save you time and money, and increase the safety and efficiency of your team. Beyond these benefits, Modula systems are secure from theft or damage as they can only be picked through automatic operators with authentication passwords. Modula software integrates with your systems, allowing you to manage the VLM easily with all the information you need in one, convenient place. VLMs. Cost effective parts storage & inventory management. Modula systems address all your warehouse needs, from securely storing both large equipment and parts, as well as all the smaller tools, equipment and components. The VLM warehouse storage systems not only recover space by using your available floor to ceiling capabilities, but creates a more efficient working environment for your employees by offering a quick, easy and safe way to access and retrieve your stored items. Increase warehouse storage & usher in automation with vertical lift modules. Optimizing your warehouse doesn’t need to be a headache with Modula Vertical Lift Modules and Bradford Systems. We can design a VLM system to give your warehouse the space you need to streamline, increase productivity and efficiency, all while increasing your bottom line. 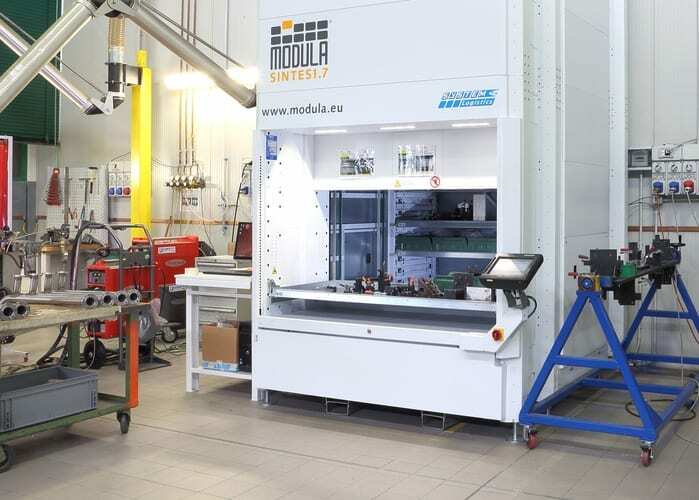 The Modula Lift has spent an outstanding 20 years on the market, with thousands of successful custom installations throughout the world and across industries. 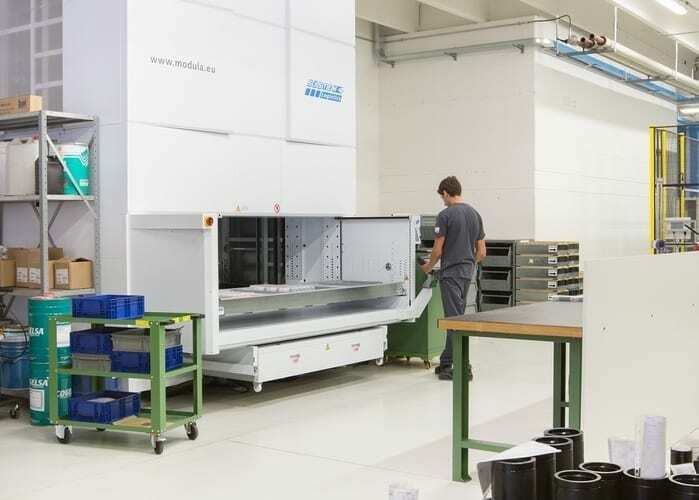 As the most reliable and advanced VLM on the market, this solution allows shop owners to create needed space while improving speed, accuracy and efficiency. This solution is ideal for industrial products, components and spare parts – for all industries and environments. It’s flexibility and wide range of models has made it a favorite amongst many companies. Paired with its innovative, superior design and ease of use, it’s easy to see why. The Sintes1 is a popular automated VLM, designed with small to medium applications in mind. Compact and secure, it is ideal for storing/picking items like pharmaceuticals, tools, and electronic components. The Sintes1 has a modern and sleek appearance, while being incredibly durable with a coated steel interior and pre-coated exterior panels. Small to medium applications benefit from its compact size, regaining space and increasing safety. The Sintes1 recovers space in all environments, saves you time and money, increases safety and efficiency, helping you gain control over your inventory with custom WMS. The Modula OneTon is the VLM for all your heavy items and stored materials. The OneTon offers 2,200 lbs. net payload per tray and complete protection devices for operators – representing the leading edge of VLM technology. The Modula VLM OneTon is an innovator in user ergonomics, providing maximum operator safety in all working conditions. Innovative and convenient, the Modula OneTon redefines heavy duty with its 2,200 lbs. per tray and is available in four different models to suit your needs. The Modula Cube takes a different approach at space solving solutions as a horizontal lift system, ideal for high-value items in low ceiling applications. The Cube features an intuitive touchscreen console, providing ease and efficiency. 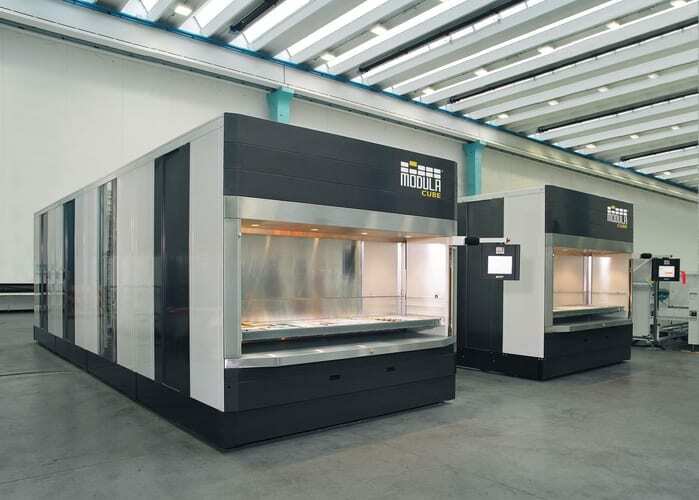 The Modula Cube is made from multiple modules, storing trays in two columns within the modules – one at the front, another at the rear. Trays are moved between modules to operators at the opening via a shuttle that travels horizontally and vertically to reach the operator. Rotor Clip performs its retaining ring and hose clamp manufacturing in a 238,000 square foot facility located in New Jersey. Watch how ASRS and vertical lifts modules impacted their facility by saving them valuable space, protecting inventory, and helping their team find goods quickly. Modula Sintes1 lifts were installed at Symrise, a flavor and fragrance provider located in Manhattan. The units store small bottles and reference samples for a laboratory environment on an upper floor of a high-rise building, and were installed in a clearance height of less than 10 feet. At the world headquarters of Dassault Falcon Jet Corporation, Modula lifts were installed to help the operations team more accurately and efficiently pick the 300,000+ aircraft parts in their warehouse. See how Modula’s easy and intuitive operator interface, barcode readers, internal bay dual delivery, and more made a huge difference.